How does Warren Ellis write so freekin’ much?! First off, I read Gravel #2, and it wasn’t terrible! It didn’t really have much in the way of plot development or story, but it was pretty, and there were ghost-horses and spilled brains! (Literally, brains. Brains are a bit too graphic me for some reason. The blood I didn’t really mind, the the brains? Yeesh.) So yeah, if you’re not a fan of man on stallion action, then maybe this isn’t the book for you. There were about six pages of ghost-horse chasing Gravel, while he flips and jumps and gets hit and finally finds his special ghost-shooting gun. It’s cool, but not super cool. The latest issue of Freak Angels, on the other hand, is absolutely fantastic. Awesome art and a compelling story. My only qualm with the series thus far is that we’ve got a lot of characters we’ve now been introduced to, and I’m not sure whether the plot is really moving along at all. We have some notion of the “bad guy”, an outcast Freak Angel, but otherwise we’re really just getting glimpses into the lives of the characters so far. 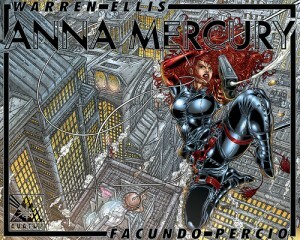 Finally, I also just read Anna Mercury #1, and damn if it wasn’t awesome. This book was swashbucklingly spectacular. We basically get thrown into a steampunk-like world where there are magneticly powered space ships that fly to the moon. 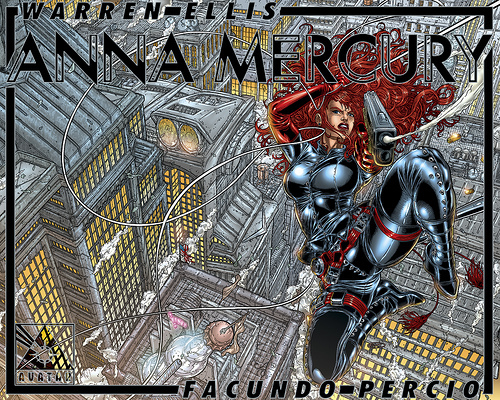 Anna Mercury herself is a red-haired firebrand secret-agent type who is clearly not afraid to break a few eggs to crack the case. We even glimpse her mission control in the comic’s last page, which makes us wonder where exactly Anna is at this time. As with these other comics, I felt a little let down that more didn’t happen in this issue. We did get introduced to a so-far-so-intriguing world, but we got left with a big cliff-hanger, and not much else. I wonder if the answer to my initial question is that Ellis is stretching himself pretty thin. He can write a bunch of comics each month because each one is really only a few pages of story, with a bunch of filler thrown in for good measure. Don’t get me wrong, none of these are all filler, but all of them felt a bit padded to some degree. Surprisingly, the one that felt the least like it was padded was the one without any page-length constraints whatsoever. If you haven’t started reading Freak Angel yet, now’s as good a time as any to get started!